A few other notes to help you make your decision – Check the labels! You want to look for wording like: “Equal to 60 watt incandescent” so you know what you are replacing. The label “Warm White” and “Soft White” are going to have the incandescent bulb glow. It may also say 2700K or 3000K. The term “Cool White, “ Daylight,” and “Bright White” are brighter, colder, and harsher. These may be good for areas of high traffic in your home or office. These may also list the numbers 4000K or 5000K. You may also see the term ‘Lumens.’ This refers to the amount of light that you want. More lumens mean brighter light than lower lumens. 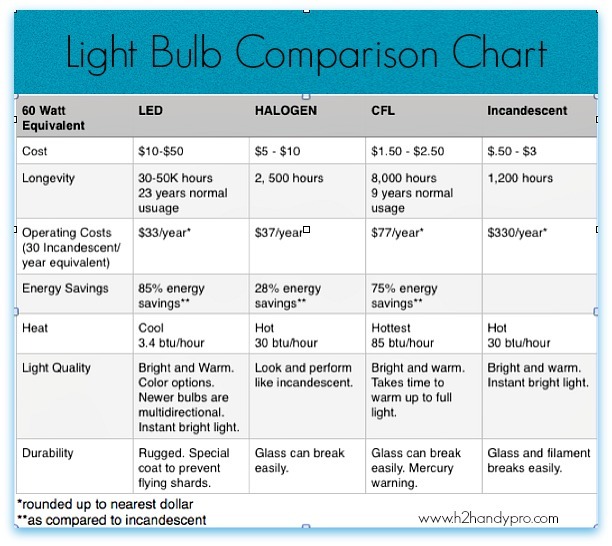 The same wattage of a bulb can have different lumens. We hope this helps guide you to make the change without too much anxiety. If you have any questions or need more guidance, just drop us a line at wade@h2handypro.com What types of bulb are you going to use? Which areas of your home are you going to target first? Leave us a comment below. We would love to hear. For more lighting options, check out our Pinterest page right HERE.